As the types and media of art expand into time and address all senses, institutions built to accommodate silent and motionless art are falling short. Rapid technological development in sound and visual tools in recent decades have since opened the door to a reimagination of the museum experience, deeply enhancing the ways in which an artist can communicate with the audience. With today's advances, the experience can be both individual and shared, further empowering the creation of a complete sonic and visual environment. ISM Hexadome is designed to reflect the progress of our time and the artists among us pushing the boundaries between technological possibilities and artistic spaces. 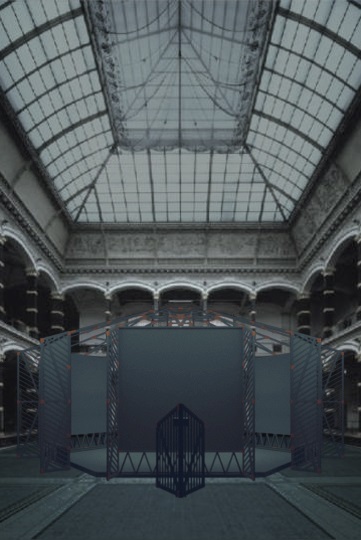 During March - April 2018, 9 individual and collaborative installations and performances will be presented by outstanding international contemporary artists from the sound, immersive art, and visual disciplines in the Atrium of Berlin’s Martin-Gropius-Bau. Within the ISM Hexadome, each work opens a door into a world crafted in sonic and visual detail, demonstrating the significance and power of spatialization for sound in complete harmony with immersive visual art and architecture. Developed by the ISM in collaboration with Pfadfinderei and ZKM | Center for Art and Media, the ISM Hexadome is an immersive experience that fuses art with technology, unlike any previous experience within a museum context. Throughout 2018 - 2019, the ISM Hexadome exhibition is scheduled to travel internationally. Each selected artist and collaboration will be released and featured on berlin-ism.com leading up to the exhibition, profiling their approach and intention toward their work with the ISM Hexadome, while offering a glimpse of the extraordinary experience to come. ISM Hexadome is a new direction, designed to stimulate perception, and underscore the possibilities of a shared direct and immersive experience.